Hazel McCallister loves her life. Perfect grades. Perfect best friend. Perfect boyfriend. Until her perfect boyfriend cheats on her with her perfect best friend. Now Hazel’s in free fall—until her best friend’s brother, Felix, gives her the perfect idea. Reclaim her power by taking revenge on her cheating ex. Felix James loves his life. Casual relationships. Loads of surfing. He’s as drama-free as they come. But he can’t stand by when his sister steals her best friend’s boyfriend, and the dude insists it was Hazel’s fault. So Felix vows to help turn Hazel into a girl her ex can’t resist—so then she can break his heart. With an alliance in place, Hazel’s revenge is all but assured. But with each piece of payback, she feels a stronger attraction to Felix, even though revenge will turn her into a girl Felix could never be with. And soon Hazel has to make an impossible choice: revenge...or Felix, the boy who’s stolen her heart. 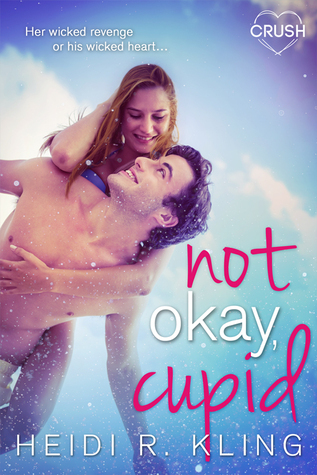 For reals, I’m conflicted about how I feel about Not Okay, Cupid. And for whatever reason, even though the characters were sixteen or seventeen, I’m not entirely sure which, they seems to me like they were just tweens. All of them. With their cupid and psyche obsession, where the guy where a DIAPER (?) and the bad boy who sleeps around can’t get over how cute this girl is. I’m all for the girl that tames the bad guy – the worse the guy is the better – but come on, at least make me believe he is who you say he is. For the first half of the book, I was rather dumbfounded at how it was reading like something twelve year old me would have read. How her boyfriend and her best friend were hands down each other’s pants in the CAFETERIA and yet nobody notices, what a terrible best friend her best friend was with ‘but your boyfriend and I have something special’ and how she herself was ready to get MARRIED and have KIDS with her high school boyfriend who was a complete ASSHAT. I tried to garner sympathy for this silly main character, I really did, but I just couldn’t. She was whiny, she didn’t know what she wanted out of life, or how to do anything when life got even a little hard. She somehow always needed a guy by her side, and then there was this bad guy (yes, I’m going to say this again) that she could be sarcastic with (not really though, that was all just silly, not sarcasm) and that made her feel like herself. He even called her Basil. UM. UHM. Anyway, I kept hoping that this book would get better, but it simply did not. I guess I’m quite disappointed. 2 stars. You're not the only one who had problems with this one. I've read a couple more reviews stating the same thing, and It's enough to tell me to keep moving. I hate to be rude or to offend writers, but the last few titles that I've read from any Entangled line have been "meh". It seems anyone can get signed to them. I am looking forward to any books from Leah Rae Miller that they publish. That's it, until I see one that catches my eye. From the moment I read the blurb, no backtrack from the moment I seen the cover of this book my mind screamed CHEESE so cheesy and it looks like I wasn't wrong. Judging by yours and others' reviews this books seems much too immature fro my liking so I know I won't be reading anytime soon.